As we approach the end of the school year, my thoughts inevitably begin to turn towards the next school year. It is like this every year. I start to look at what went well, what didn’t go so well and things I want to focus on for next year. During this time, I also ask my staff for some additional input and then see how the two things (what I think went well and what needs to be addressed and what they think) fit together. Gathering staff input is critical to my personal growth and making sure that I am living our theme of “getting better every day”. I do this in a variety of ways with a variety of different tools. Gathering feedback is an easy process. Honestly reflecting on the feedback is another story. When you decide to ask for feedback, you also have to agree to look at the good and the bad, and ask yourself truthfully what you need to do as the leader to improve your performance. Getting honest feedback is not easy. Hearing that some of your people are not as happy as your think is painful at times, but necessary for our personal growth. As hard as it is to do, we have to remember not to take it personally. It is not an attack on you, just honest feedback. Each year I schedule meetings with every team and department (where they are not teamed). The agenda is simple, there isn’t one. I show up, and they do the talking. I tell them upfront that I will answer questions, listen to them talk about anything they feel like talking about and take copious notes. The floor is totally theirs. This year I added one thing. I asked each group to bring something good to the table. I wanted to hear whatever they have to say, but I also asked them to talk about what is going well. These meetings provide me with a gage on how the staff is doing, what is on their minds and what topics I need to be thinking about as Principal. These notes also become talking points when our administrative team meets. At the end of each year, I also send out a survey to all staff members. Over the years, these surveys have developed and changed. I have learned not to ask what I already know. I have altered the questions so they are more in depth and provide me with answers and feedback that is meaningful. I read an article recently that gave me some great ideas on questions for this year’s survey. HERE is the link to article. If you are thinking about using a survey with your staff, this is a great place to start. The key is to make sure that you are asking the questions that will provide you the feedback you are looking for. Make it your own. I have also asked my assistant principals to conduct these surveys as well. The way teachers respond to PA’s is different than the way they respond to me. Also, there is a different dynamic with assistant principals and principals. In closing, asking for feedback from your staff can be a valuable experience. the key is to do it with the right attitude and use it for personal growth. It is also a good thing to remember that you have to look at the feedback honestly. Lastly, it is important to understand that just because someone responds in a certain way does not mean it is accurate or fair. The trick with feedback is to find the balance between the two. 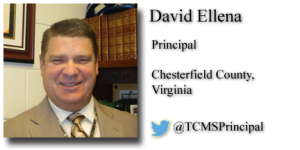 David Ellena is the Principal of Tomahawk Creek Middle School in Chesterfield County, Virginia. President of the Virginia Association of Secondary School Principals. He shares his insights on his website, A Principal’s Life. 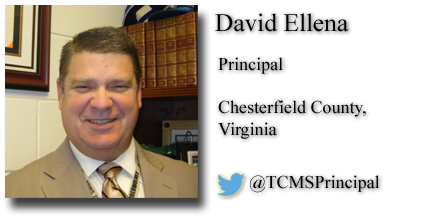 Follow David on Twitter at @TCMSPrincipal.